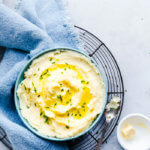 The creamiest, fluffiest delicious Mashed Potatoes flavoured with garlic, sour cream and fresh chives. Enjoy this easy side dish on its own or as an accompaniment for the mains. Instructions include Two ways to make it - Instant Pot & Hob. Pour 1 Cup of water to the instant pot insert. Place the peeled, chopped potatoes inside the steamer basket and place it inside the instant pot insert. Pressure Cook at HIGH PRESSURE for 8 minutes, followed by QPR. Remove the steamer basket with potatoes and allow the water to drain and set it aside.In the meanwhile, discard the water in the instant pot insert. Press SAUTE button. Once the indicator beeps HOT, add butter & garlic.. Allow it melt. Press CANCEL. Add the potatoes to the melted butter mixture and begin mashing with potato masher. When its half way done, add sour cream and mash again until smooth and creamy.Season with salt & pepper to taste. Taste and Season with more salt and pepper if needed. Transfer to a serving bowl, add a blob of butter, garnish with chives. Enjoy them on its own or as a holiday side dish. Add potatoes to a pot of salted water . Cook until tender approximately 15 minutes. Fork test the potatoes for its doneness., Drain. Heat butter, minced garlic over low heat in a sauce pan until butter is melted. Mash the potatoes well with a potato masher or potato ricer. Add the melted butter mixture along with sour cream and mix the potatoes well until mashed potatoes are smooth,creamy and delicious. Season with salt and pepper as needed. Taste and add more blob of butter if you would enjoy. PS: To deglaze the pan, add a splash of milk if needed. If you find your mashed potatoes too hard or clump like, add a splash of milk and mix it well. Reheat the spud mash before serving, if you are making it ahead of time. For variation, You can add cream cheese to this mash. But if you would like to make it with just milk, you can leave our sour cream from the recipe and just use milk.